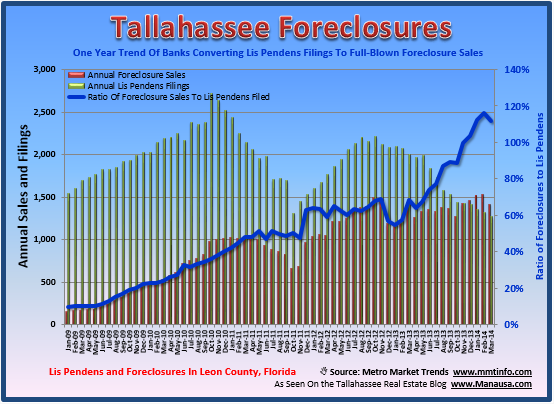 The newest numbers are out regarding foreclosures in Tallahassee, and they are not good. The second quarter of 2012 showed a 102% increase over foreclosures in Tallahassee during the 2nd quarter of 2011, a staggering rise by anybody's standard. There is still time left for you to enter to win a FREE iPad. Visit --> Tallahassee Real Estate Blog, <-- to enter the contest. Last year, banks were handcuffed due to the robo-signing scandal, but this year the gloves are off and the banks are trying to clear their books of these non-performing loans. In the real estate graph above, we see the one-year trend of new lis pendens filings (green bars), the trend of new foreclosure sales (red bars) and the ratio of these two recordings (blue line). The ratio is important because it shows how foreclosure sales are far more likely today after a lis pendens filing (42% of the time) than they were historically (12%). In the past, when somebody was served with a lis pendens, they would sell a home in order to save the equity in the home. In fact, only 12% of the time did these typically end up in a foreclosure sale. But things are different today. Nearly half of all lis pendens filings are going to a foreclosure sale, and homeowners are rarely in a position to defend any equity. The overall impact on the market is simple. Distressed properties are no longer a niche part of the market that we can ignore. Foreclosures in Tallahassee will be a major driver in the market for many more years, and these high-motivation sellers will continue to reduce prices until they are all gone. If you have a sell a home in Tallahassee, you need to understand your place in the market. If you are a distressed sale, then buyers have an expectation of value. If you are an arms-length sale (non-distressed), then buyers have an expectation of condition and terms, and they will not get too crazy on the price. If you are thinking about selling your home, drop me a note and we can review how foreclosures in Tallahassee affect your specific home and whether or not now is the best time for you to sell your home.